A delightful chromolithograph from the early days of lithography. 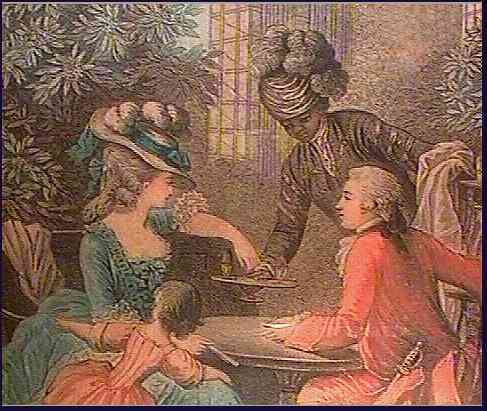 Underneath the image is printed in small font: "Feint par Baudouin peintre du Roy" LL and "Bennet direcit" LR; titled in large script: "Le Gouter" (The luncheon). 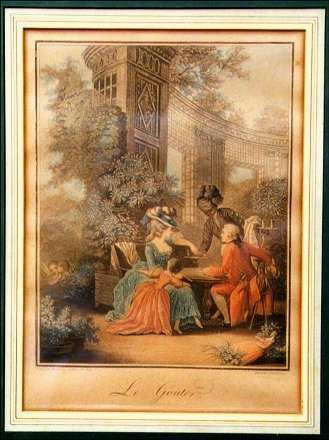 As the young couple enjoy their repast in an opulent setting, the young girl pulls at her mother's knee to bring her attention to the children kissing behind the bush. Photographed assembled, so reflections from the glass are present.